Many of us blessed with perfect curly hair were also blessed, or another unspeakable word, with not so perfect curly eyebrows. The existence of these longer, curly brows is annoying, frustrating and often talked about! After all, it is cutting in to our beauty sleep, and no one is okay with that! Let’s face it — those extra few minutes of sleep or sipping coffee in the morning can really set the tone for the rest of our day. The last thing that we want to be doing is taming any unruly brows. These tips and products will give you some guidance as to how to create perfect eyebrows and take on the day with confidence! Why Are Our Brows Curly? Keeping your curl brows at bay doesn't have to be painful or a hassle! The same way that our eyebrows match the same color as our natural hair, they also possess qualities of the style and type of hair that we have as well. This is why people who have hair that grows really fast and thick must constantly be trimming their brows, and why people with curly hair have curly eyebrows as well. Trim, trim trim! As curly brows tend to get out of control, the best way to start to get them tamed is to trim and brush them. By first brushing them, you will be able to see how long your eyebrows actually are, and then use your trimmer and tweezers to shape your brows to the look you want. It is very helpful to first look through magazines and see what the current, perfect eyebrow trends are. This way, you will have a clear idea of what you want. 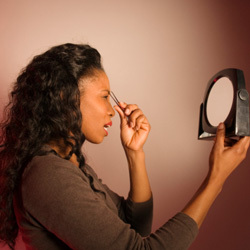 Using a brow shaper as a guide can also be helpful during this step, especially if you have not done it yourself before. Wax and gel! After you have trimmed and brushed your brows to the point where you achieve the overall look that you are going for, the next step would be to apply a strong wax product to your brows. This will help straighten the curl, and lock the perfect eyebrow shape in. After the amount of wax that you are comfortable with is applied, use a brow gel (such as Anastasia Brow Gel) and apply that on top. This is a trick of the trade for curly brows because it really locks your look in with double the power. By applying the wax first, the gel has something to adhere to that will help it stay in place longer and stronger. If all else fails, using a brow shaping and defining kit is another way to assist in achieving your overall desired look. Most of these kits come well equipped with all the necessary products to help keep your unruly brows in place. Nervous about trimming your brows for the first time on your own? Watch professional cosmetic artist Brett Freedman take on the challenge! Don’t let refining your rowdy brows get you too stressed! 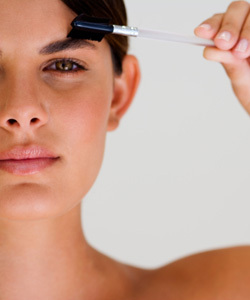 It is all a process of trial and error until you find what works best for your curly eyebrows. Once you have implemented the system that works best for you, this process will become the least of your problems!